The Rediwa C.A.T 5 system is a mixed concealed fastening system (chemical and mechanical). In keeping with our policy of quality and safety adopted at the design process of fastening systems, the Rediwa C.A.T 5 combine the advantages of the grooves on the back of the tiles which provide for a concealed mechanical fastening of the tiles and the properties of the latest generation MS adhesive putties. MS Adhesive putty and a couple of grooves on the back of the ceramic piece (one on the top and another on the bottom), allow the aluminium profiles that constitute the hanging mechanism of the ceramic pieces to be positioned. The upper profile has an Omega shape and the lower one has a hanger shape. 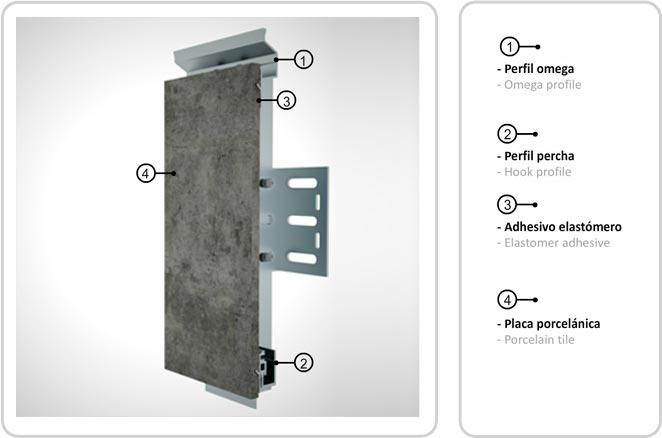 The hanging part of the tile on the structure is established with stainless steel screws from the Omega to the vertical profile. That is how the perfect facade planimetry is obtained. The main difference with other longitudinal fastening systems is that this does not need a secondary structure, because the omega profile fulfils that function. With this kind of anchorage, as in the Rediwa C.A.T 1 system, the ceramic piece does not become detached if it is broken, so it also provides the maximum safety and reliability levels.